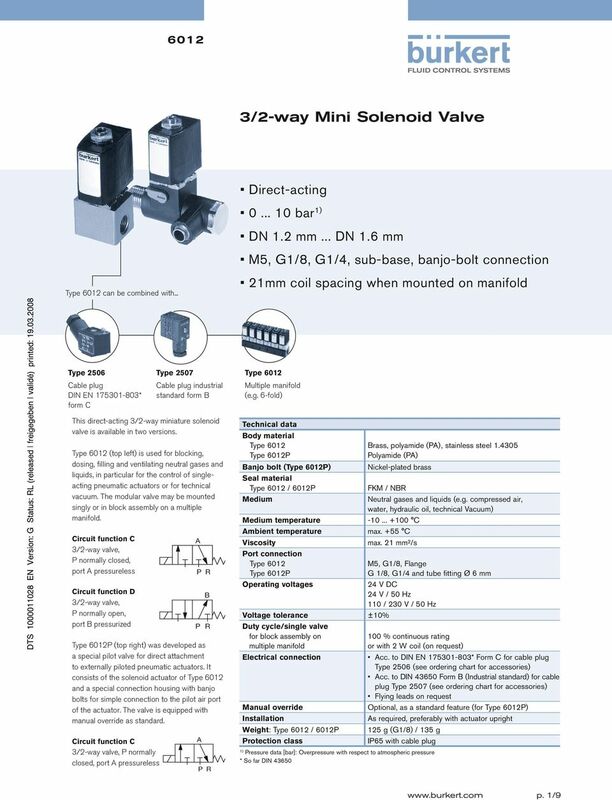 Download "3/2-way Mini Solenoid Valve"
3 Ordering chart subbase subbase [bar] Kv value water [m³/h] P body with manual St. st. body without manual brass body with manual brass body without manual D Port onnection Voltage/ frequency [V/Hz] ircuit function Type : Solenoid valve in threaded port or subbase version with electrical coil connection acc. 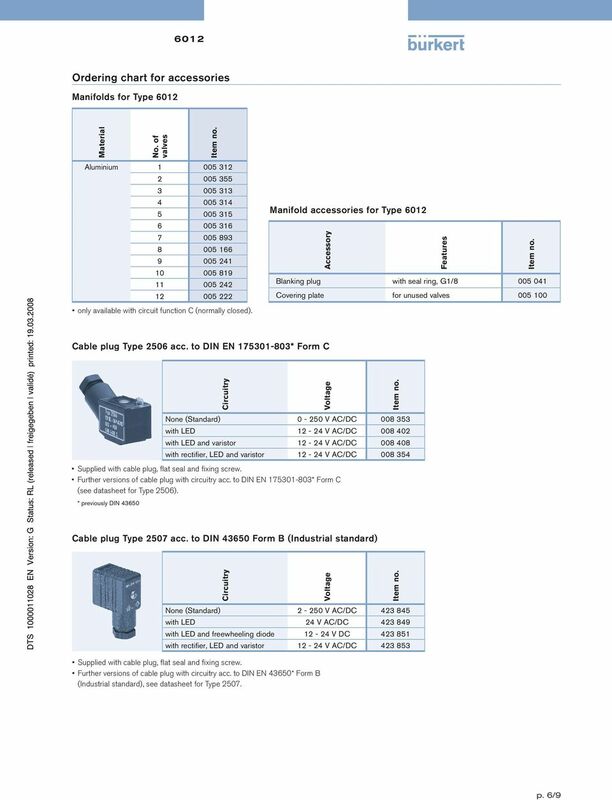 to DIN EN 17303* Form for cable plug Type data [bar]: Overpressure with respect to atmospheric pressure * previously DIN 30 ll valves with FKM seal; without cable plug. other versions on request. 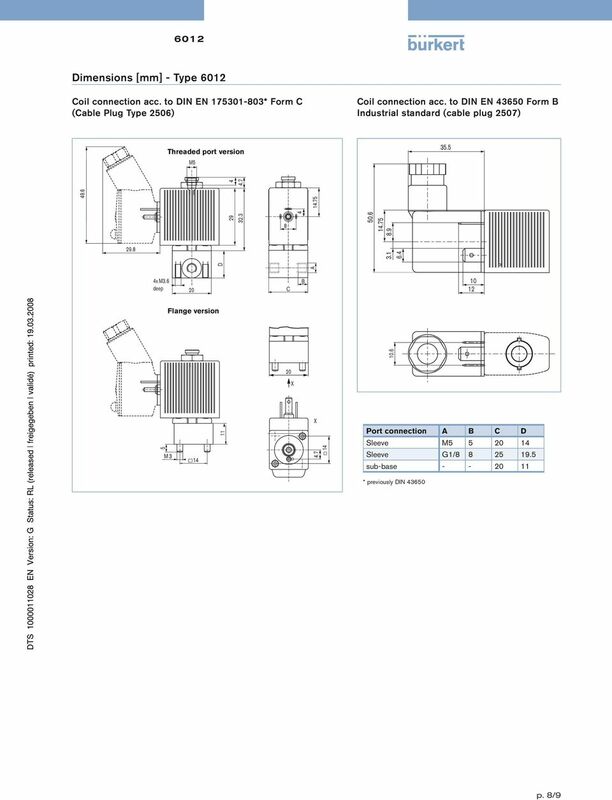 4 Ordering chart Kv value water [m³/h] [bar] Voltage/ frequency [V/Hz] brass body without manual brass body with manual St. st. body without manual P body with manual Port onnection ircuit function Type : Solenoid Valve with threaded port or subbase version with electrical coil connection acc. 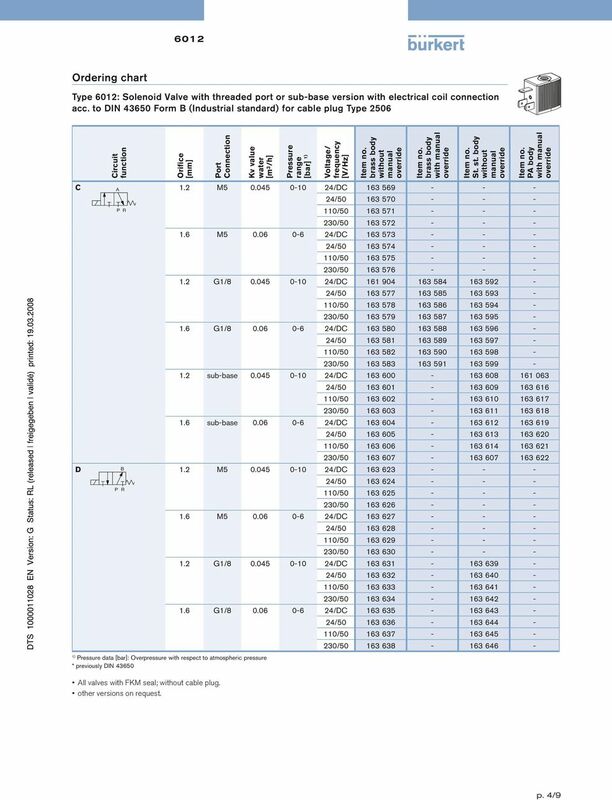 to DIN 30 Form (Industrial standard) for cable plug Type D subbase subbase data [bar]: Overpressure with respect to atmospheric pressure * previously DIN 30 ll valves with FKM seal; without cable plug. other versions on request. 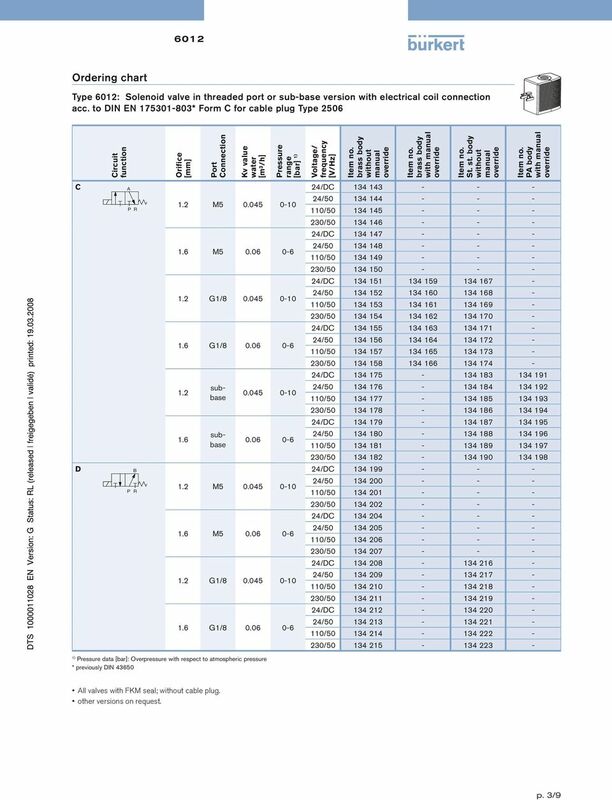 6 Ordering chart for accessories No. of valves luminium Material Manifolds for Type Features ccessory Manifold accessories for Type lanking plug with seal ring, overing plate for unused valves 00 0 only available with circuit function (normally closed). Voltage ircuitry able plug Type 20 acc. to DIN EN 17303* Form None (Standard) 0 20 V /D with ED 2 V /D with ED and varistor 2 V /D 00 0 with rectifier, ED and varistor 2 V /D 00 3 Supplied with cable plug, flat seal and fixing screw. Further versions of cable plug with circuitry acc. 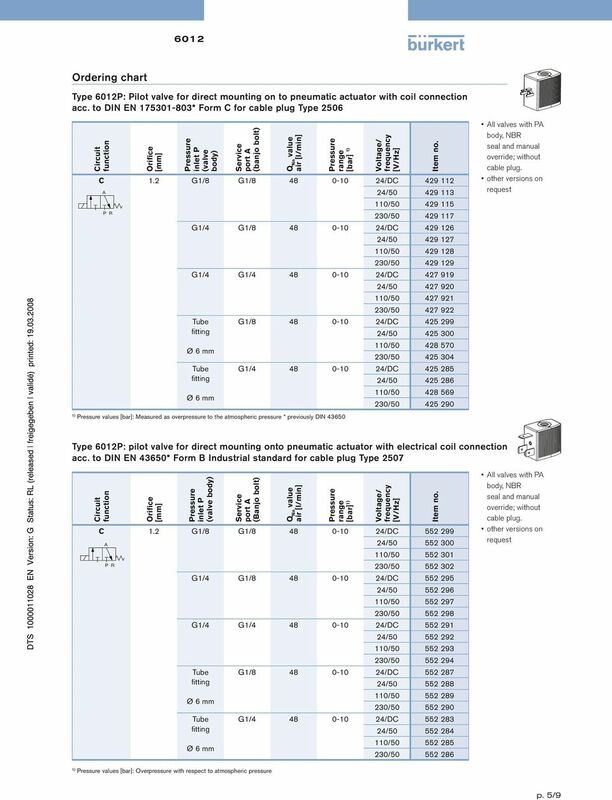 to DIN EN 17303* Form (see datasheet for Type 20). * previously DIN 30 Voltage ircuitry able plug Type 207 acc. to DIN 30 Form (Industrial standard) 2 20 V /D 23 with ED 2 V /D 23 9 with ED and freewheeling diode 2 V D V /D 23 3 None (Standard) with rectifier, ED and varistor Supplied with cable plug, flat seal and fixing screw. Further versions of cable plug with circuitry acc. 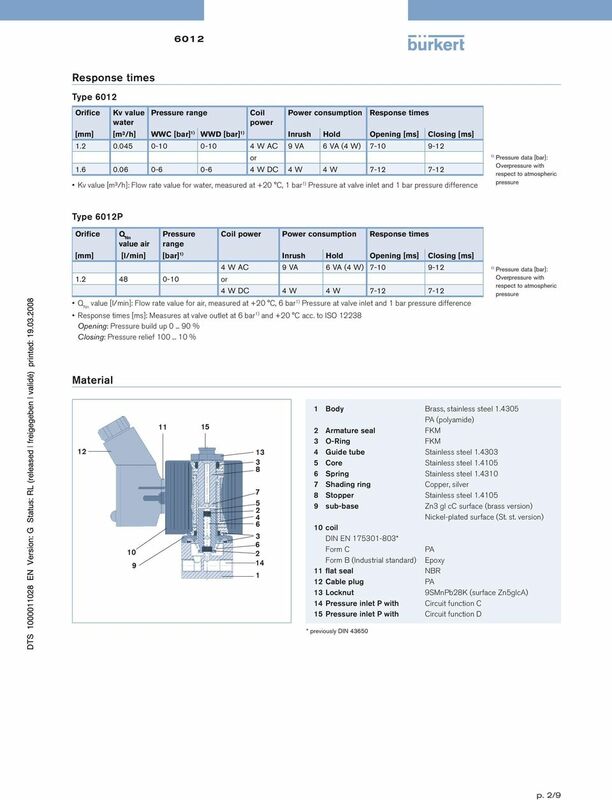 to DIN EN 30* Form (Industrial standard), see datasheet for Type 207. 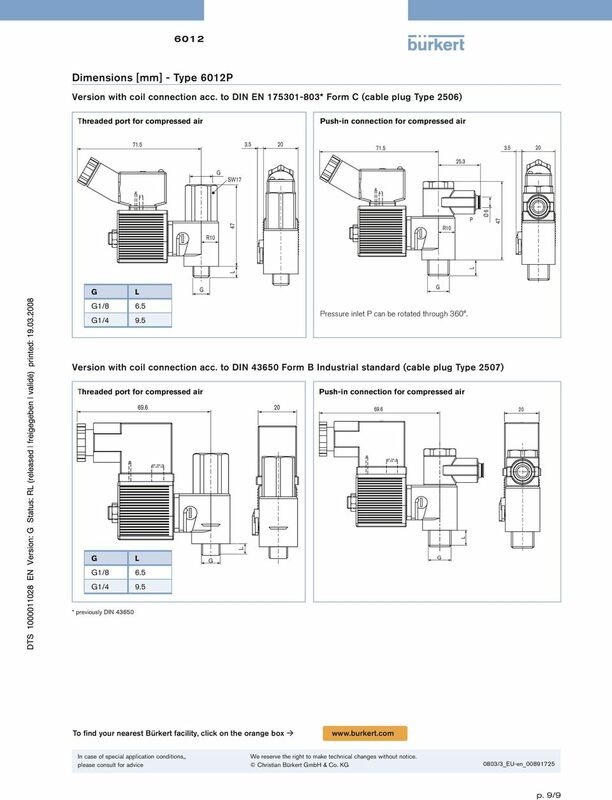 Direct acting port solenoid valve (general purpose valve) Series NC (normally closed) type Port size: Rc/, Rc/ JIS symbol Common specifications Working fluid Working pressure differential range MPa Max. 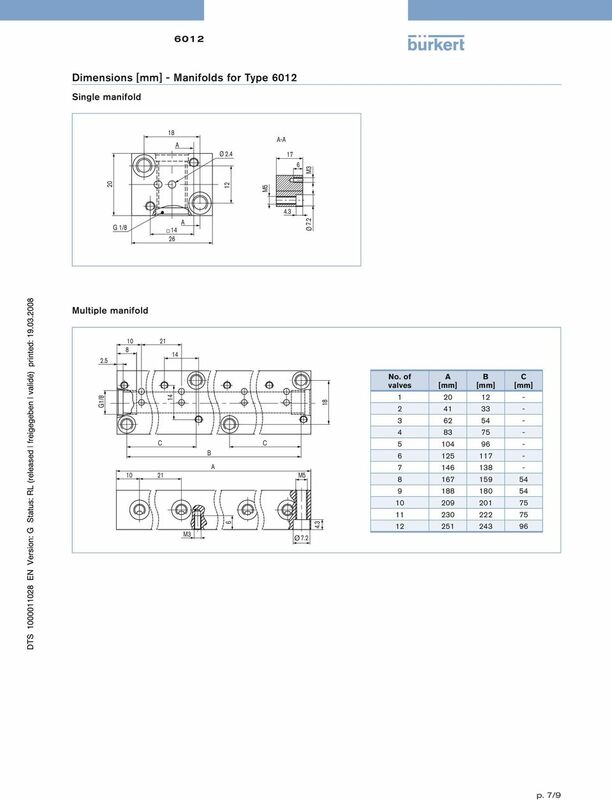 ubber Seal ort Solenoid Valve Series SYJ00/00/700 [Option] SYJ VQZ V VG Improved pilot valve ilot valve cover is stronger using stainless steel. Mounting thread is also reinforced from size M1.7 to M.
Fluid. Flu. Fluid Fluid. uid Power d Power P. Fluid Power P. Fluid Power. Fluid Power Power. d Power. Directional Cetop Valves DCV 03. In addition to the basic models, it is also possible for the units to be outfitted with add-ons. Solenoid Valve, Plastic Construction The EMÜ directly controlled 2/2-way plastic solenoid valve has a high performance coil which is hermetically separated from the medium by means of a flexible PTFE bush.